Summer camping season is in full bloom and we always recommend you spend your days off enjoying the outdoors. Of course, that means you should gear up and we all know a good sleeping bag is a top priority. TETON Deer Hunter Sleeping Bag is rated for 0 degrees F and provides both comfort and the looks. The first thing to notice about this sleeping bag is probably its cool retro style. Besides the looks, TETON Deer Hunter Sleeping Bag has a bunch of great features. It has a double-layer construction that additionally contributes to its warmth but also durability. 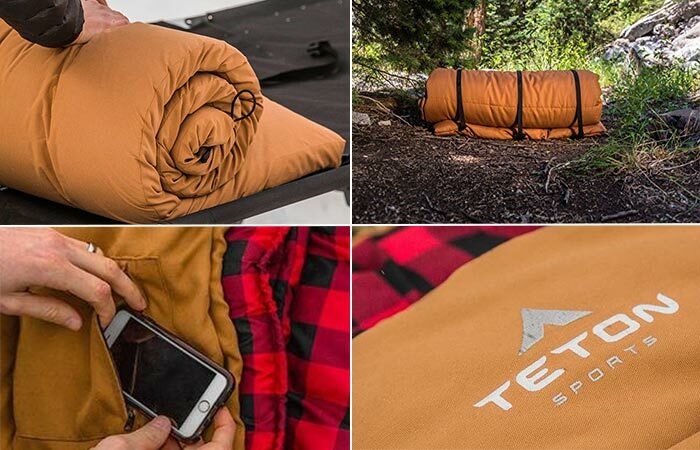 With its double-layer construction, TETON Deer Hunter Sleeping Bag is made to keep you warm and comfortable, even at 0 degrees F.
When talking about durability and protection, it’s important to mention that TETON Deer Hunter Sleeping Bag is made from a heavy-duty canvas shell that is water resistant. Yup, that means you’re gonna stay warm and dry no matter what weather conditions you face. The zipper goes almost all the way around it, useful for reducing drafts. Another cool thing about the zipper is that there are right and left-hand zippers so you can connect two bags. This sleeping bag features a heavy-duty canvas shell, drawstring hood, a brushed flannel lining, and an inside pocket. It’s very easy to pack, move around and store. 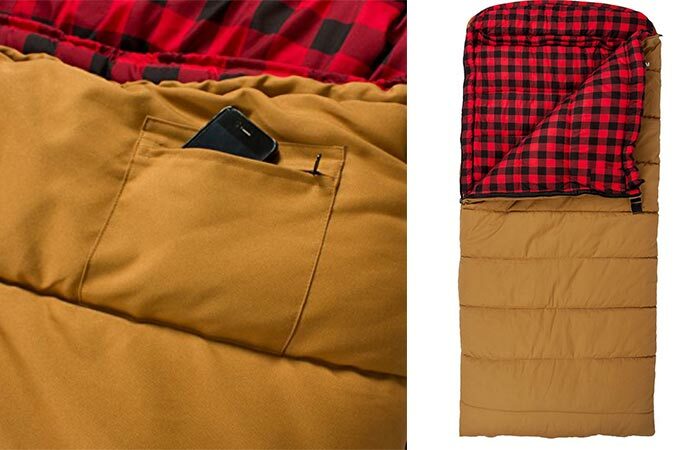 TETON Deer Hunter Sleeping Bag features a brushed flannel lining, drawstring hood, and a nice inside pocket, perfect for keeping your necessities next to you but also for not having to get your hands out of the bag to reach your phone. When you’re done using the sleeping bag, roll straps will help you pack it efficiently but also contribute to its portability and easy storage. As for the dimensions, it’s 90″ long and 39″ wide.